Fashion has no bounds and keeps emerging its new trend of style every now and then. Its impact on apparels seems to be tremendous as it keeps on hitting out for the innovative one. Among clothing, tuxedos tend to be one of the most inevitable attires of the modern men's wardrobe to flaunt style in their own way. And so the fashion designers have come out launching different types of tux collections that are fresh and updated and it is noticed that people largely tend to choose their desired one based on the blend color combination. Apart from the regular tuxedos such as wedding tux, prom tux, business tux and other formal collections that comes in single breasted and double breasted model there is been a different and unique variety of tux combo that remains forever favorite by men is the exotic red and white tuxedo collections. This type of outfits goes well only for casual occasions. The collection comes with the regular kind of tux features that resemble same in fabric, design, pattern, cut, fit and make but vastly differs only in the color version. 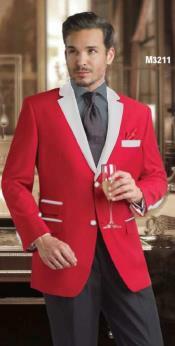 The tux jackets and shirts are of mix and match type where one can try out his own blending of favorite colors. Stripes Shirts - Single color stripes for solid color mens tuxedos. Multi color stripes for sports jacket or Shirts and pants worn without a tux or jacket. The kind of fabric been used is the blend of multi fabrics such as polyester, cotton, rayon, silk and wool. Among fabrics wool is been considered as the superior quality and the price tag for the wool made tuxedos quite expensive than the other collections. 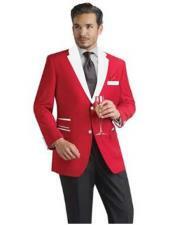 Some of the new arrivals of red and white tuxedos include: Party tux Funny Mens red and white Wicking tux, Mens Polyester Training Moisture red and white tux, Italian Stallion red and white tux, 2 button red and white tuxedos, 2016 custom made red and white tuxedos for modern men, High Quality Italian Men Royal wool tux. Complementing the tux jackets, the pants also come with stylish features such as front pockets, zipper accents, Hook-and-eye closure and trendy patterns striping down the legs.